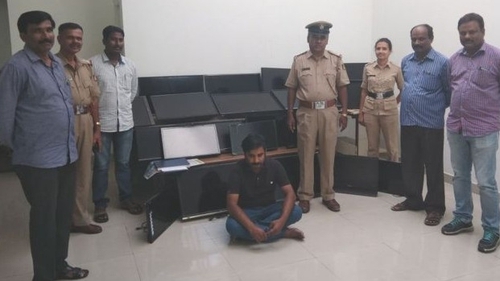 Police in India have detained a man who stole 120 television sets from hotels over four months, according to officials. If the room television did not fit his bag, the 34-year-old man would go out to a local market to buy a bigger suitcase, police alleged. Hotel staff never suspected him as he was very well behaved. Mr Nanaiah also paid a small advance sum and told staff he would be staying for several days but generally left early, Chetan Singh Rathor, deputy commissioner of Bangalore police told AFP. "We arrested him earlier this month when he was trying to sell TV sets to a shopkeeper, who alerted the police," he added. Mr Nanaiah told officials that he stole TVs because it was "relatively low risk and easy", according to police. "He said that his recent thefts went to fund his lawyer and legal fees for previous TV theft charges in different courts," Mr Rathor said.